A Day in First Grade | Making Grammar Fun! 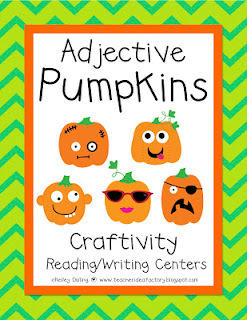 — Adjective Pumpkins! Making Grammar Fun! — Adjective Pumpkins! Yet, we have been struggling with adjectives. My littles “get” the concept yet they have a hard time coming up with actual adjectives when describing things. Sometimes we are right on the money. Yet, other times, we come with similes, metaphors, comparisons…. and the like. However, we (finally!!!) are starting to get it! Today we did this amazing craftivity from Kelley Dolling over at the Teacher Idea Factory! She made this rockin’ pack called Adjective Pumpkins! Then I introduced the craftivity! The kids each got to pick an adjective for a pumpkin that they were going to create. They were SO excited! I let them take a piece of orange paper, black and green and let them get their creative juices flowing. Then my class wrote sentences about their pumpkins! And then I hung them up on our bulletin board! If you want to grab this craftivity, head over to Kelley’s TpT store. I promise you, it was a HUGE hit in my class!! I’m sure your students will love it, too!! Girl . . . you made my night. It is so fun to see lessons working in classes other than your own. Thanks so much for posting this! Hugs! I agree! Kelley’s activity really helps to make learning adjectives fun and meaningful. Looks like your students did an excellent job!